Cornell economists Professor Panle Jia Barwick, Professor Shanjun Li, Graduate Student Deyu Rao, and Graduate Student Nahim Bin Zahur examined the links between air pollution and health-care costs across 367 Chinese cities. 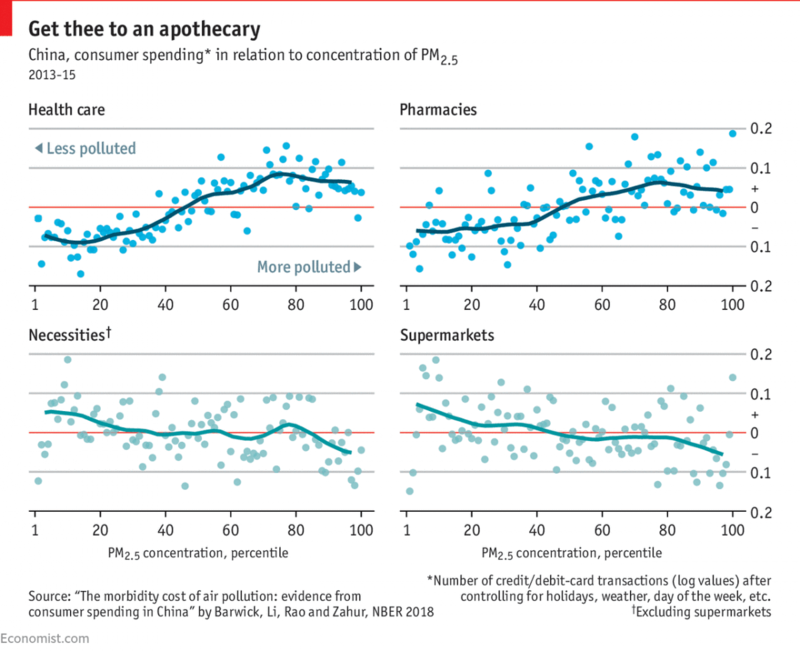 After analyzing hourly pollution readings and consumer charges in China from 2013-2013, the study found consumers were likely to spend more on health care services and goods when fine-particulate matter was high. Although healthcare spending increased, credit and debit charges in supermarkets seemed to decrease as shoppers elected to stay inside. The working paper also suggests that if the Chinese government decreases air pollution to comply with the World Health Organization’s standards, the country could have an annual reduction of about $42 billion dollars in health care spending, or nearly 7% of all healthcare spending in China in 2015. Panle Barwick is an Associate Professor of Industrial Organization, Applied Econometrics, and Applied Microeconomics in the Department of Economics at Cornell University. Professor Barwick is also the Co-Director of Cornell Institute for China Economic Research (CICER). To view Professor Barwick’s Cornell faculty profile, click here. Shanjun Li is an Associate Professor of Environmental and Energy Economics and Sustainable Enterprise in the Dyson School of Applied Economics and Management at Cornell University and is the co-director of Cornell Institute for China Economic Research (CICER). Professor Li’s research goal is to improve public policy making through understanding the impacts of public policy and efficient policy design. To see Professor Li’s Cornell faculty profile, click here. Deyu Rao is a Ph.D. student at the Dyson Cornell SC Johnson College of Business. Rao’s area of interest is in Environmental, Energy, and Resource Economics. To view Deyu Rau’s Cornell graduate student profile, click here. Nahim Bin Zahur is a Ph.D. student in the Department of Economics at Cornell University. Zahur’s research interest include Empirical Industrial Organization and Environmental Economics. To see Nahim Bin Zahur’s Cornell graduate student profile click here.